When our first daughter was born we were living eight hours away from my family, my husband was in seminary, and we were both working full-time jobs. We were in the process of renovating our home, and I was about to make a career change. To say that it was a difficult season of life, would be somewhat of an understatement. I called my sister-in-law about three days after our sweet baby was born just bawling because I felt so completely overwhelmed. After I was finished complaining, I remembered that she had four children, a husband in ministry, and had lived eight hours away from her family for ten years. And she was completely right. It was the hardest thing I’d ever done. And when my second baby was born, it was the hardest thing I’d ever done. The fact that someone else had done the same thing more often than me, did not make my struggle any less difficult for me. Having a baby is hard. And for most women, it’s the hardest thing they’ve ever done. It doesn’t matter if it’s their first or tenth; it’s the hardest thing they’ve ever done. Related: Is It Okay to Just Have a Bad Day? Taking care of the newborn might become easier the more often you do it, but if you’re on your fifth child that means there are four other kids who need you too. And often people want to help, but they aren’t sure exactly what to do. 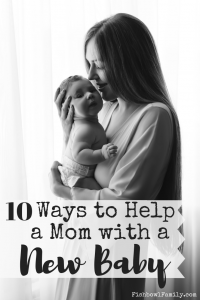 Here are ten ways you can help a mom with a new baby. TakeThemAMeal.com is an amazing, free site that allows you to set up a calendar for meal deliveries. It’s completely free and keeps everyone in the know about the meals the family is receiving. Our church sets up the calendar to deliver meals three times a week usually on Tuesdays, Thursdays, and Saturdays. This is great for several reasons. First, twelve meals last for a full month using this method. Secondly, there’s no wasted food. With our first baby, we got so much food the first week we got home, there was no way we could eat it all. Then, we got two meals the second week and none the third. By delivering only three days a week, the family is guaranteed three home cooked meals a week plus time to eat any leftovers. Our church tries to bring meals for eight weeks. Most working moms go back to work after six weeks, so it’s nice to have a little extra help the first couple of weeks back. The biggest struggle with this is getting people to sign up to bring meals to families that they don’t know very well. It is important to see this as a great opportunity to show God’s love even if you’re an introvert! You show up with warm food, compliment an adorable baby, and leave having strengthened the bonds of fellowship with loving service. Check out this post for our top 10 favorite easy meals. While you are preparing a meal for them, go ahead and make an extra for them to freeze. Bring them a piping hot lasagna to eat that night and one to go in their freezer for later. That way when the meal deliveries stop, they will have some delicious meals ready in their freezer. If you want to take this a step further, arrange a day later that you can come back and help make meals to fill their freezer. A friend and I made meals together one Saturday while our husbands took our kids out of the house, and it was so much fun! We ended up making lots of food for our freezers and having a great time doing it. 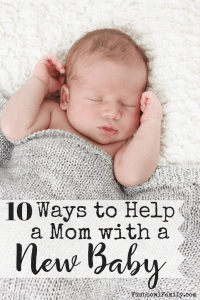 This post, Ten Ways to Help a Mom with a New Baby, contains affiliate links for your convenience. 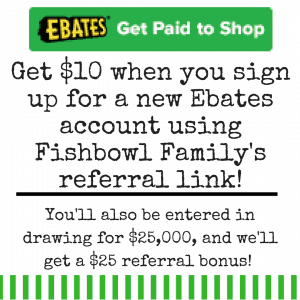 This means that if you click on a link and make a purchase, I’ll receive compensation at no extra cost to you. Read our full disclosure policy. Bring some toilet paper or trash bags or paper plates. Remembering to buy paper towels when you’ve only gotten five hours of sleep in the last three days is nearly impossible. Depending on how well you know the family, you can make this more personal or generic. Everyone will use Dawn dish soap, but your best friend may be the only one that loves St. Ives peach body scrub. This is another one that kind of depends on how well you know someone. Most people will let you wash their dishes, fold their clothes, or sweep their floors if your offer to do so sounds sincere. But if you are at the sink with your sleeves rolled up and say, “Can I wash these dishes real quick for you?” and then insist that you’d love to when they tell you not to worry about it, they’ll let you. And even if they try to stop you, they’re so sleep deprived they don’t stand a chance. They’ll answer the location and follow up with a comment on how I don’t need to clean anything. I’ll just go ahead and clean anyways in whatever room they’re in and continue talking about baby stuff while I do it. Cleaning for a friend while they hold their baby and talk to me has never been awkward, but it has always been appreciated. Ask how things are going and then just listen. When you respond, do your best to normalize things. Every new mom is worried that something is not quite right with her or her baby or even her husband. It’s all new and scary and incredibly isolating. Help them to feel like they aren’t alone in their experiences. Share a story about when you went through a similar experience and how it all turned out just fine. *Remember to be on the lookout for Postpartum Depression symptoms. Because this is the hardest thing they’ve ever done, most moms cannot recognize the symptoms in themselves. You can find a full list here. This can be hard for veteran moms to do because we want to tell them exactly how to swaddle the baby and lie them down at the perfect moment after feeding to ensure they will drift right off to sleep. Sometimes moms do need tips from other moms, but usually, they’ll ask for help. The best way that I’ve found to advise a new mom is to simply give them a copy of a parenting book that I really like. Often, they don’t read it right away but rather when they’ve had a few weeks to try things out on their own. Then they want their baby to start sleeping through the night, and they pick up that copy of Babywise. Birthing a baby after nine months of carrying it inside of her is the most amazing thing a woman’s body will ever do. Unfortunately, the aftermath is not so pretty. The stretch marks and hair loss alone were enough to make me cry, and those were just the beginning. Remind this new mom that she is beautiful because she is. Just make sure to give a compliment that is sincere and true. Don’t tell her that her hair looks great when it’s up in a messy bun and obviously hasn’t been washed for four days. Instead, tell her that she looks radiant when she’s holding her new baby or that her living room is very clean or simply that she looks great and that motherhood suits her. But whatever you do, don’t ask how much weight they’ve lost. Wash your hands, and then offer to hold the baby so the mom can go shower, wash a load of clothes, sleep, or whatever. Most moms of newborns have their lives on a 2-hour schedule of feedings, so squeezing in a shower can be difficult, to say the least. When our first daughter was born, people came over often and wanted to hold her, but they also wanted to sit and chit-chat with me. As much as I loved knowing that they loved me and wanted to know how I was doing, I would have loved a hot shower without worrying about the baby even more. When you’re headed to the grocery store, text and ask if you can pick anything up for her. With texting, you don’t have to endure an awkward conversation or risk waking her up from a nap. With each new addition to our family, my confidence in grocery shopping without my husband gets very shaken for a while. 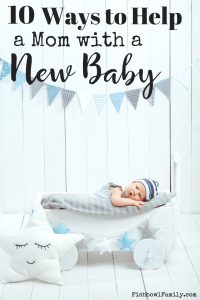 It’s very difficult to take a new baby out because of the sheer mechanics of all of the stuff they need, but it’s also scary to get them out and risk exposure to germs. If you’re already at the grocery store, picking up some Eggos and orange juice is no big deal, but it does show your love for this family in a very tangible way. Looking back through all the photos of those early days with each of our kids, there are a ton of pictures of the babies, but there are very few pictures with me in them. I was usually the one taking the photos of the kids doing something cute or being with someone new. The ones of me with them as newborns are extra special even though I look terrible in them. It doesn’t even matter because I loved those first days with them when I couldn’t get over how tiny their little fingernails were and how exciting it was to have them open their eyes and actually look at me. Swoon. So take a picture of the mom and her baby and ignore all of her prattle about how awful she looks. This will also be a good time to give some of those compliments. Another great thing to do for a friend with a new baby is to make a photo book for her. Moms often get overwhelmed trying to make photo books because they want everything to be perfect. If you make one for her, she’ll have the pleasure of having a book but none of the stress of creating it. This link will give you a free book from Shutterfly. There is nothing as wonderful and exciting as a new baby, and those first weeks of a baby’s life present the best opportunity to minister to her parents. You can rejoice with those who are rejoicing and meet their needs with love. 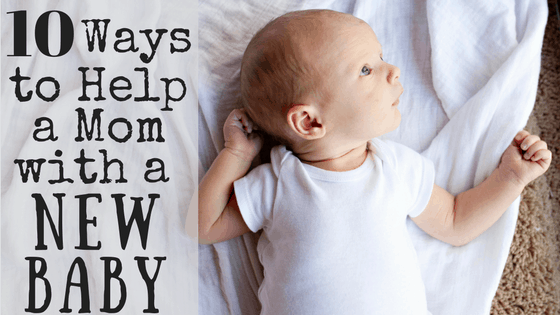 Parents need help with a newborn, and there is no shame in admitting it. Take it as an opening to be like Jesus. What’s your favorite way to help a mom with a new baby? Tell us in the comments! Is it Okay to Just Have a Bad Day?